พลเรือเอกเซอร์มาร์ค แสตนโฮป หัวหน้ากองทัพเรืออังกฤษได้กล่าวไว้ว่า "พูดง่ายๆ คือ ประเทศที่ต้องการมีอิทธิพลทางยุทธศาสตร์นานาชาติต่างมีเรือบรรทุกอากาศยานในครอบครองทั้งนั้น"
Most navies only operate one or two aircraft carriers, if any. The USA is a notable exception, having large numbers in service. A total of 20 fleet carriers are in active service with ten navies. Additionally, the navies of Australia, Brazil, China, France, India, Italy, Japan, South Korea, Spain, Thailand, the United Kingdom, and the United States also operate ships capable of carrying and operating multiple helicopters and STOVL aircraft. CATOBAR types are operated by Brazil, France and especially the USA, which has ten in service. STOBAR type are operated by China, India and Russia. STOVL types are operated by India, Italy, Spain and the USA. ASW ships are operated by Japan. An offshore helicopter support ship is operated by Thailand. Amphibious assault ships are operated by France, the Republic of Korea, the United Kingdom and especially the USA, which has nine in service. A total of 20 fleet carriers are in active service by ten navies. Additionally, the navies of ออสเตรเลีย, บราซิล, จีน, ฝรั่งเศส, อินเดีย, อิตาลี, ญี่ปุ่น, เกาหลีใต้, สเปน, ไทย, the สหราชอาณาจักร, and the สหรัฐ also operate ships capable of carrying and operating multiple helicopters and STOVL aircraft. The Canberra class of landing helicopter docks, based on the Spanish vessel Juan Carlos I, are currently under construction, intended to enter service between 2014 and 2016. The class is being built by Navantia and BAE Systems Australia; and HMAS Canberra is the largest ship ever built for the Royal Australian Navy. Canberra underwent sea trials in late 2013 and is to be commissioned in early 2014, while HMAS Adelaide is expected to enter service in 2016. The Australian version retains the ski-ramp from the Juan Carlos I design, although the RAN has opted against a carrier based fixed-wing aircraft capability for the time being. 1 CATOBAR carrier: NAe São Paulo (A12): 32,800 tonne ex-French carrier Foch (launched 1960), purchased in 2000. 1 STOBAR carrier: The เหลียวหนิง was originally built as the 57,000 tonne Soviet Kuznetsov-class carrier Varyag and was later purchased as a stripped hulk by China in 1998 on the pretext of use as a floating casino, then partially rebuilt and towed to China for completion. The Liaoning was commissioned on 25 September 2012, and began service for testing and training. On 24 or 25 November 2012, Liaoning successfully launched and recovered several Shenyang J-15 jet fighter aircraft. 1 CATOBAR carrier: Charles de Gaulle (R91): 42,000 tonne nuclear-powered aircraft carrier, commissioned in 2001. 3 Amphibious assault ships: Mistral-class 21,500 tonne full deck amphibious assault ships with hospital and well deck. เรือบรรทุกอากาศยานของกอทัพเรืออินเดีย INS Vikramaditya และ INS Viraat ใน ค.ศ. 2014. 1 STOBAR carrier: INS Vikramaditya, 45,400 tonnes, modified Kiev-class. The carrier was purchased by India on 20 January 2004 after years of negotiations at a final price of $2.35 billion. The ship successfully completed her sea trials in July 2013 and aviation trials in September 2013. She was formally commissioned on 16 November 2013 at a ceremony held at Severodvinsk, Russia. 1 STOVL carrier: INS Viraat: 28,700 tonne ex-British STOVL converted carrier HMS Hermes (launched 1953), purchased in 1986 and commissioned in 1987, scheduled to be decommissioned in 2019. India started the construction of a 40,000-tonne, 260-metre-long Vikrant-class aircraft carrier in 2009. The new carrier will cost US$762 million and will operate MiG-29K, naval HAL Tejas, and Sea Harrier aircraft along with the Indian-made helicopter HAL Dhruv. The ship will be powered by four gas-turbine engines and will have a range of 8,000 nautical miles (14,000 km), carrying 160 officers, 1,400 sailors, and 30 aircraft. The carrier is being constructed by Cochin Shipyard. The ship was launched in August 2013 and is scheduled for commissioning in 2018. 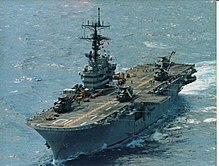 Giuseppe Garibaldi (551): 14,000 tonne Italian STOVL carrier, commissioned in 1985. Cavour (550): 27,000 tonne Italian STOVL carrier designed and built with secondary amphibious assault facilities, commissioned in 2008. 2 ASW ships:เรือพิฆาตบรรทุกเฮลิคอปเตอร์ชั้นฮีวงะ 13,950 ton helicopter-only anti-submarine warfare carrier with enhanced command-and-control capabilities allowing them to serve as fleet flagships. In August 2013, A launching ceremony for Japan's largest military ship since World War II is held in Yokohama on Tuesday, August 6. The 820-foot-long, 19,500-ton flattop เรือพิฆาตบรรทุกเฮลิคอปเตอร์ชั้นอิซูโมะ will be deployed in March 2015. 1 STOBAR carrier: Admiral Flota Sovetskovo Soyuza Kuznetsov: 55,000 tonne Kuznetsov-class STOBAR aircraft carrier. Launched in 1985 as Tbilisi, renamed and operational from 1995. Without catapults she can launch and recover lightly fueled naval fighters for air defense or anti-ship missions but not heavy conventional bombing strikes. [ต้องการอ้างอิง] Officially designated an aircraft carrying cruiser, she is unique in carrying a heavy cruiser's compliment of defensive weapons and large P-700 Granit offensive missiles. The P-700 systems will be removed in the coming refit to enlarge her below decks aviation facilities as well as upgrading her defensive systems. 1 STOVL carrier: Juan Carlos I (L61): 27,000 tonne, Specially designed multipurpose strategic projection ship which can operate as an amphibious assault ship or STOVL carrier depending on mission requirement, has full facilities for both functions including a ski jump ramp, well deck, and vehicle storage area which can be used as additional hangar space, launched in 2008, commissioned 30 September 2010. One Dokdo-class amphibious assault ship 18,860 ton full deck amphibious assault ship with hospital and well deck and facilities to serve as fleet flagship. 1 Offshore helicopter support ship: เรือหลวงจักรีนฤเบศร helicopter carrier: 11,400 tonne STOVL carrier based on Spanish Príncipe de Asturias design. Commissioned in 1997. The AV-8S Matador/Harrier STOVL fighter wing, mostly inoperable by 1999, was retired from service without replacement in 2006. Ship now used for royal transport, helicopter operations, and as a disaster relief platform. HMS Illustrious: 22,000 tonne STOVL Invincible class carrier, commissioned in 1982. Originally there were three of her class but the other two have since been retired and recycled to save money. Fixed-wing aircraft carrier operations ended after first Sea Harrier and then RAF/RN joint force Harrier II aircraft were retired by the UK as a cost-saving measure in 2010, now operating as a Landing Platform Helicopter until Ocean is out of refit in 2014 and then to be preserved as a memorial. HMS Ocean amphibious assault ship 21,750 ton full deck amphibious assault ship based on the Invincible-class aircraft carrier hull but without facilities for fixed wing aviation. 10 CATOBAR carriers: เรือบรรทุกเครื่องบินชั้นนิมิตซ์: ten 101,000 ton nuclear-powered supercarriers, the first of which was commissioned in 1975. A Nimitz-class carrier is powered by two nuclear reactors and four steam turbines and is 1,092 feet (333 m) long. Tarawa class a class of 40,000 ton amphibious assault ships, of which one, แม่แบบ:USS, remains in service. 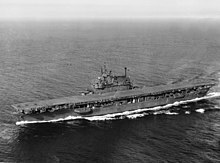 Ships of this class have been used in wartime in their secondary mission as a light carriers with 20 AV-8B Harrier II aircraft after unloading their Marine expeditionary unit. Scheduled to be decommissioned in 2014 and replaced by the 45,000 ton USS America (LHA-6). Wasp class a class of eight 41,000 ton amphibious assault ships, members of this class have been used in wartime in their secondary mission as light carriers in the with 20 to 25 AV-8Bs after unloading their Marine expeditionary unit. ↑ "Sabre et pinceau", Christian Polak, p. 92. ↑ Donko, Wilhelm M.: Österreichs Kriegsmarine in Fernost: Alle Fahrten von Schiffen der k.(u.)k. Kriegsmarine nach Ostasien, Australien und Ozeanien von 1820 bis 1914. epubli, Berlin, (2013) - Page 4, 156-162, 427. ↑ "IJN Wakamiya Aircraft Carrier". globalsecurity.org. Archived from the original on 4 June 2011. สืบค้นเมื่อ 9 June 2011. ↑ Geoffrey Till, "Adopting the Aircraft Carrier: The British, Japanese, and American Case Studies" in Murray, Williamson; Millet, Allan R, eds. (1996). Military Innovation in the Interwar Period. New York: Cambridge University Press. p. 194. ISBN 0-521-63760-0. 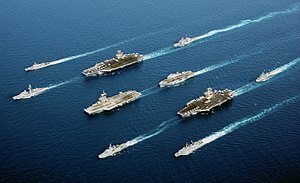 ↑ "Aircraft carriers crucial, Royal Navy chief warns." BBC, 4 July 2012. ↑ "The US Navy Aircraft Carriers". Navy.mil. Archived from the original on 21 February 2009. สืบค้นเมื่อ 30 January 2009. ↑ "China brings its first aircraft carrier into service, joining 9-nation club". Behind The Wall. NBC. Sep 25, 2012. สืบค้นเมื่อ 2013-10-26. ↑ "Liaoning, ex-Varyag". Global Security. สืบค้นเมื่อ 30 September 2013. ↑ "China's first aircraft carrier enters service". BBC News. 25 September 2012. สืบค้นเมื่อ 30 September 2013. ↑ Axe, David (26 November 2012). "China's aircraft carrier successfully launches its first jet fighters". Wired. สืบค้นเมื่อ 30 September 2013. ↑ "China lands first jet on its aircraft carrier". News. Fox. 2012-11-25. สืบค้นเมื่อ 2013-10-26. ↑ "China lands first jet on its aircraft carrier". News info. Inquirer. 2012-11-25. สืบค้นเมื่อ 2013-10-26. ↑ "Aircraft carrier INS Vikramaditya inducted into Indian Navy". IBN Live. IN. สืบค้นเมื่อ 16 November 2013. ↑ 21.0 21.1 21.2 "Indian Aircraft Carrier (Project 71)". Indian Navy [Bharatiya Nau Sena]. Bharat Rakshak. สืบค้นเมื่อ 11 September 2009. ↑ "First indigenous aircraft carrier to be launched next year: Navy chief". India Today. 2 December 2009. สืบค้นเมื่อ 9 June 2011. ↑ "INS Vikrant, India's first indigenous aircraft carrier, to be launched on August 12". NDTV. 1 August 2013. สืบค้นเมื่อ 1 August 2013. ↑ "India launches own aircraft carrier INS Vikrant". Livemint. 12 August 2013. สืบค้นเมื่อ 13 August 2013. ↑ "Cavour Page". World Wide Aircraft Carriers. Free webs. สืบค้นเมื่อ 2013-10-26. ↑ "Moscow set to upgrade Admiral Kuznetsov aircraft carrier". RIA Navosti. 6 April 2010. สืบค้นเมื่อ 30 September 2013. ↑ "Admiral Flota Sovetskogo Soyuza Kuznetsov". Rus navy. สืบค้นเมื่อ 2013-10-26. ↑ Carpenter & Wiencek, Asian Security Handbook 2000, p. 302. ↑ Author Index. "End of a Legend - Harrier Farewell | Pacific Wings". Pacificwingsmagazine.com. สืบค้นเมื่อ 2013-10-26. 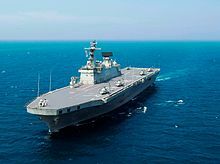 ↑ "Thai Aircraft Carrier Assists Southern Relief Efforts | Pattaya Daily News - Pattaya Newspaper, Powerful news at your fingertips". Pattaya Daily News. 2010-11-04. สืบค้นเมื่อ 2013-10-26. ↑ Ministry of Defence (2010-12-15). "Changes to Royal Navy's surface fleet announced" (announcement). UK: MoD. สืบค้นเมื่อ 2013-10-26. 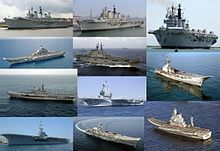 ↑ "Royal Navy's HMS Illustrious to be preserved". BBC News. 10 September 2012. สืบค้นเมื่อ 30 September 2013. ↑ "HMS Ocean (LPH01) Helicopter Carrier". Naval Technology. 2011-06-15. สืบค้นเมื่อ 2013-10-26. ↑ "Queen Elizabeth class Future Aircraft Carrier CVF (002)." Pike, J. GlobalSecurity.org. ↑ "UK, £3.2bn giant carrier deals signed". BBC News. 3 July 2008. Archived from the original on 7 January 2009. สืบค้นเมื่อ 30 January 2009. หน้านี้แก้ไขล่าสุดเมื่อวันที่ 18 มกราคม 2562 เวลา 11:07 น.